The title of this post says it all. 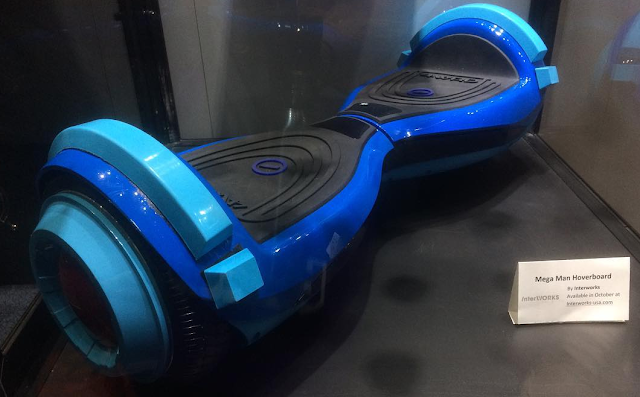 Spotted at E3, an officially-licensed Mega Man hoverboard is on the way from Interworks USA. It's expected to ship in October. Not much else to say on the subject other than state the obvious: why doesn't it look like Rush Jet or Item-2? So do I have to but this in order to be allowed to pine for new Mega Man games? nope since it's not a game or directely game related. I'm not buying anything directly Mega Man-related until we get a straight-up new Mega Man game. Legacy Collection (both of them) can screw off for all I care. �� You are not helping. You're the person I'm specifically referencing with my original post. Telling me that I should have to re-buy old Mega Man games or buy Mega Man merchandise to convince Capcom I want a new Mega Man game is absolutely pointless when the reason I started boycotting in the first place was BECAUSE they just stopped making new Mega Man games and just started cancelling instead. To me, all this merchandise means nothing because the fact that they're constantly pumping out more and more merchandise signals to me that the merchandise is definitely selling and that Capcom has decided in light of this that the solution is just to put out more merchandise instead of actually making a new game. I already own Mega Man 1-10. And Mega Man X1-6. And Mega Man BN 2-6. Both ZX games, and the first two Starforce games. I would be more than glad to buy some of this merchandise if Capcom could have the decency to put a little more effort into making a new Mega Man game than releasing a garbage mobile RPG from a few years back. Exactly what does re-buying the Legacy Collection do for me besides put more money in Capcom's pocket? It's no guarantee that Capcom will make a new Mega Man game. It's been nothing but merchandise for several years, and the only thing Capcom has to show for it so far is a crappy-looking tv show and a re-release of old Mega Man games. I've already bought at least one indie game that's clearly aping Mega Man because Capcom won't put out anything, and I'll buy more of those games (I'll even eventually pick up Mighty No. 9 despite the tepid at best response) if I see them. If Capcom isn't going to put out anything but figures and hover boards and earphones and whatnot, I'll gladly just buy the knock-off games instead. "Imagine if Mega Man had some sort of ITEM to use to fly! Possibly like a JET so he can RUSH to the scene! Anyway here's a blue Mega Buster style hover board." This comment is, like, ten times better than anything I was thinking of writing. Thank you. Credit where it's due. Just when I think they must have run out of merchandise to slap the license on, they somehow come up with something else. But hey, must admit that this one is pretty original merch. they don't come up with straps or figure, they go overboard. Now if a megaman fan want a overboard, he no which one to get. having a overboard licensed is'nt going to hurt. it's there, you can ignore it if it's not for you. Probably the most mistreated franchise of all time. It's probably brand recognition. Item-2 or Rush would be marketable to MM fans, but maybe not to general gaming audiences. Plus both are oriented the wrong way. If they're gonna go the in-game route, they'd be better off making a unique design based off Rush. Rush has a MM helmet already, so all they'd really need to do is paint this in red, white, and pink. Where to order one? And how much does it cost? Thanks. This is awesome. Waiting for the release and price when it is ready. Is it currently released? how much is it worth?